I'm looking for advice on the best conditioner or lubricant for rubber seals. The problem is never ending rattles and squeaks. It's all very much weather dependent as well with squeaks in the cold, but rattles in the warmer weather. It never does it when it rains or there is snow on the roof. So I'm wondering what is on the market that will condition a rubber seal without deteriorating the seal??? Or maybe a light skim of lithium is ok. I dunno. But this nonstop squeaking and rattling has to end. Ford sure as hell doesn't care. Lithium grease is a 'light'/ thin grease, it should be okay- just rub it around with your fingers. Also, if you can find it online, a clear silicon grease makes a good, non-intrusive, lubricant. Most auto parts stores/ flaps don't carry it; it is considered a specialty product.. I use a rubber lubricant called "P-80", but i think its more of a temporary assembly lubricant. For a "conditioner", i think silcones are usually considered better. 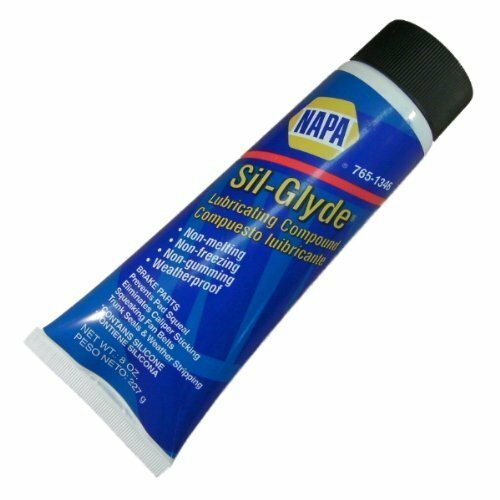 One such product is "Sil-Glyde", often used for rubber brake parts. I’ve used this to solve a few squeaking issues on the rear gate in an SUV. Makes the rubber seals look good too. I went to NAPA yesterday, but buddy said they only carry Sil Glyd in US stores. But they had a silicone based lubricant by Kleenflo that is supposed to be an equal. I am going to give it a shot. Sil Glyd is available on Amazon though. Hoping it does the trick. If you have a nearby civil airport, they may have the dow corning aero products. DC-111 or DC-55 are both grease consistency silicones. Some others are basically hydraulic fluids (I forget what those callouts are). That isn't to say that they're safe on the rubber in this application. These can also be ordered online. Also, a restaurant supply may have food grade silicone grease on the shelf.